Hey there fitness lovers! Perhaps, you are already aware that green smoothies are a healthy weight loss food because they are not only chockfull of fiber and low in fat, but can be nutrient-rich as well. However, making a healthy weight loss smoothie is an art that many of you might not know how to make an ideal healthy weight loss smoothie? I’ve got some important green smoothie making tips to help you create the perfect weight loss shake. This is the good stuff that I wish I knew about when I first starting blending and drinking the greens. I have learnt these tips after many years’ hand on experience in making weight loss smoothies and all that I am sharing here with you! How To Make Weight Loss Green Smoothie? 1. Skip Dairy Ingredients: Don’t get tempted to use milk or yogurt. Avoid using these foods if you are aiming for an ideal green smoothie for weigh loss, and instead use water or plant milks such as almond, coconut, hemp and cashew milk. They contain lesser fat and calories. If calcium is your concern then don’t worry – you would already be getting a lot of calcium from the leafy greens that you need to add for making a green smoothie. 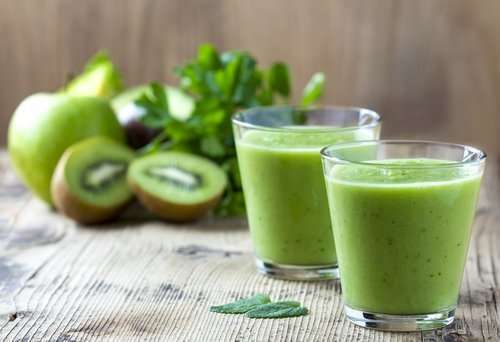 You can add good amount of spinach, kale or dandelion greens (as per your desired taste) along with oranges, kiwifruit, figs and a tablespoon of chia seeds to create a smoothie that has more calcium than a glass of milk. 2. Add A Little Of Healthy Fat: Put in about 1/4 of a ripe avocado, or a tablespoon of chia seeds or flaxseeds, or some fresh young coconut to perk up your smoothie with some heart healthy fats. Nut milks are great choice, too! Moderate healthy fat will not make you fat. Healthy, plant-based fats are beneficial and help you control weight. However, keep in mind to limit the overall fat content because higher fat content and fruit together in a green smoothie can trigger gas and bloating. Remember fat means lot of calories as well. Although, calories from whole foods are good for you, but too many calories from any source may subvert your weight loss aim. 3. Use Raw Natural Sweeteners: Add bananas, mangoes, grapes, apples, pears and other sweet fruit to any weight loss green smoothie that tastes bitter or is a bit too “green”. This way you can avoid artificial sweeteners and processed sugars. Ditch the honey, agave and maple syrup. Any concentrated sugars will covert a healthy, weight loss smoothie into a sugar bomb. Refined and concentrated, processed sugars are the bad boys who will sabotage your efforts to lose weight. If at all you must add a sweetener to your smoothie, try pitted dates. However, aim for stop using them as soon as you can because dates are a dried food with concentrated sugars. 4. Use A Quality Protein powder: Lately, I have learnt something very important while working with my registered dietician. It’s crucial to include protein with every meal and snack. Therefore, I recommend for adding a scoop of whey protein powder to a green smoothie for shedding fat. I have noticed, this can make you stay fuller and satisfied longer. The added protein also will help recover your muscles if you workout. 5. Green Smoothie Weight Loss Meal: An effective way to lose weight is to use green smoothies as a meal replacement. Swap one meal every day with a weight loss smoothie to cut back your daily calories intake. Along with lower calorie intake, this way you can also enhance intake of fruits and vegetables that will increase your water and fiber intake as well – all these together will help you shed lot of pounds! Just Fitness Tip: Keep a note of it somewhere. Green smoothies as a meal replacement should contain around 350 calories only. This much amount of calories is appropriate for a weight loss meal. Such a green smoothie meal will keep you full and satisfied longer without making you feel hungry and susceptible to cravings, until your next mealtime. 6. Use Fresh, Whole Foods: Fresh fruits, vegetables and dark leafy greens are rich source of fiber, packed with natural water and loaded with micronutrients, which all combined together will stimulate your metabolism. For those who want to save money, they can buy frozen produce or the fresh ones in bulk and freeze for later use. Always keep in mind not to use canned fruits because usually they are soaked in syrup and nutritionally much inferior to fresh fruits. 7. The Most Effective Weight Loss Smoothie Foods: Whereas most of the fruits and vegetables work well for a weight loss smoothie, but there are a few those are remarkably outstanding. Go for the foods that are low in calories, but high in fiber as they are best to trigger weight loss. Some of the foods that I recommend include grapefruit, pumpkin, kale, apples (with skin), blueberries, pomegranates, chia seeds, raspberries, pears (with skin), strawberries, bananas, oranges, broccoli, celery, cucumber, carrots and all leafy greens for making weight loss smoothies. Another important ingredient I use is raw oats because they offer a filing texture to a green smoothie and at the same time pack in protein, healthy fat and fiber. 8. Weight Loss Smoothie Ratio: Now comes the most important factor that you should know. An effective ratio of fruits to greens that I recommend for weight loss smoothies is: 2 pieces of fruit (such as a banana and apple) to 2 to 3 cups-full leafy greens (spinach, kale, collards) and 8 ounces of water or homemade nut milk. Throw in either a tablespoon of chia seeds (soaked in water for 5 minutes), 1/4 ripe avocado or 1/4 cup of raw oats. Add in a scoop of protein powder, if you desire a protein punch. (i) Many people ask me can “weight loss green smoothies” alone result into desired weight loss? My answer is don’t rely ONLY on green smoothies for weight loss. No doubt, green smoothies surely help you lose weight but remember you need to make long-term modifications in your diet and lifestyle as well to provide faster and sustaining results. (ii) To make your green smoothie extra chilly, freeze your favorite fruits like ripe bananas, grapes, pineapple or berries. This way you can also avoid the wastage of ripe fruits (like those brown bananas in your kitchen). You can also try freezing leafy greens in a freezer-safe bag so that you simply need to add the frozen greens straight to the blender. Make sure not to defrost these fragile little good things! Don’t you now want to go straight to your kitchen and try the above tips? Please also share your own green weight loss smoothie tips under the comments below!